If, as is the situation with the conspiracy theorists, there is no evidence to support your allegation, from a legal standpoint you’re out of court. But even if you’re out of court, if you can at least argue that “well, there’s no evidence of this, but logic and common sense tell you it is so,” you still have talking rights and you can still play the game, as it were. But when you not only have no evidence, but logic and common sense tell you it isn’t so, it’s time to fold your tent. It’s essentially become a religious belief with the theorists that there was a conspiracy behind Kennedy’s death, and with religious beliefs, the believer knows the truth, so there has to be an explanation for everything that seems to contradict that truth. Their reasoning, then, is to start the debate assuming the very point that has to be proved (Kennedy was killed as a result of a conspiracy), and anything that is at odds with this belief has to have an explanation, no matter how ridiculous and far-out it may be. Nothing you tell the conspiracy theorists can shake their belief in a conspiracy. In situations where even they can’t come up with an explanation, they shield themselves from the evidence by either distorting or ignoring it. This type of intellectual carpentry by the buffs allows them to proceed forward with their fantasy, unfazed by the inconvenient interposition of reality. As with the evidence of Oswald’s guilt, which has already been presented in very abbreviated, summary form, here’s the evidence of no conspiracy. As you are reading this list, I would ask you to take a moment to ask yourself whether the individual point you are reading, all alone and by itself, clearly shows there was no conspiracy. I believe you will find this to be the case with many of the points. Re: Bugliosi's "Conclusion of No Conspiracy"
1. Perhaps the most powerful single piece of evidence that there was no conspiracy in the murder of President Kennedy is simply the fact that after all these years there is no credible evidence, direct or circumstantial, that any of the persons or groups suspected by conspiracy theorists (e.g., organized crime, CIA, KGB, FBI, military-industrial complex, Castro, LBJ, etc.) or anyone else conspired with Oswald to kill Kennedy. And when there is no evidence of something, although not conclusive, this itself is very, very persuasive evidence that the alleged “something” does not exist. Particularly here where the search for the “something” (conspiracy) has been the greatest and most comprehensive search for anything in American, perhaps world, history. I mean, way back in 1965, before over forty additional years of microscopic investigation of the case by governmental groups and thousands of researchers, Dwight Macdonald wrote, “I can’t believe that among the many hundreds of detectives, Federal Bureau of Investigation and Secret Service agents, and [counsel] for the Warren Commission…not one would be bright or lucky enough to discover or stumble across some clue [of a conspiracy] if there were any there.”2 But not one clue of a conspiracy has ever surfaced. And this is so despite the fact that the two people the conspirators would have had to rely on the most not to leave a clue, Lee Harvey Oswald and Jack Ruby, were notoriously unreliable. A conspiracy is nothing more than a criminal partnership. And although conspiracies obviously aren’t proved by the transcript of a stenographer who typed up a conversation between the partners agreeing to commit the crime, there has to be some substantive evidence of the conspiracy or partnership’s existence. And in the conspiracy prosecutions I have conducted, I have always been able to present direct evidence of the co-conspirators acting in concert before, during, or after the crime, and/or circumstantial evidence from which a reasonable inference of concert or meeting of the minds could be made. In the Oswald case, if, for instance, Oswald had disappeared for a few days before the assassination without adequate explanation, or within these few days he was seen in the company of a stranger, or there was evidence he had come into some serious money, or he had made any statement to anyone, such as Marina, suggesting, even vaguely, a conspiratorial relationship, or someone had called him at the Paine residence and he left the room and took the call in another room, or he was seen getting in a car after the shooting in Dealey Plaza, or any of a hundred other possible events or circumstances had occurred, that would be one thing. But here, there is nothing, nothing. Just completely foundationless speculation and conjecture. This is particularly startling and noteworthy when one stops to realize that those making the allegation of conspiracy necessarily have the burden of proof. I mean, it makes no sense for A to say to B, “I allege that there is a conspiracy here. Now you prove there isn’t.” The alleger always, by definition, has the burden of proof. To say that those alleging a conspiracy in the Kennedy assassination have not met their burden of proof would be the understatement of the millennium. Here, the absence of any credible evidence of a conspiracy is bad enough for the conspiracy theorists, but, as demonstrated on these pages, there is much, much evidence pointing irresistibly in the direction of no conspiracy. Conspiracy theorists, in contrast, make completely baseless assumptions and then proceed to make further assumptions based on these assumptions. I liken their approach to engineers on the planet Bizarro in the late 1920s. When designing the bizarro Sydney Harbour Bridge they decided to commence construction from the middle of the bridge and then extend from there to each side on the banks of the harbour. When asked what will support the central sections above the waters during the period when there were no other sections in place they replied "we'll deal with that when the time comes." Of course they ran out of sky hooks and everytime they made a start the material fell into the harbour and sank to the bottom. The Warren Commission only said there was no evidence of a conspiracy, foreign or domestic - and laid out the case against Saint Oz. Bugliosi goes a step further and mocks the kooks for mindlessly insisting there had to be a conspiracy, even though there's still no evidence of one 50 years later. He not only hangs their hero, he rubs their snouts in their own feces. Yes VB certainly ripped them a new one. He was intolerant of stupidity and saw no need to use diplomatic language when calling them out especially the obvious liars and attention seekers who deserved to be hit right between the eyes. I have a gut feeling that some CTers believe Oswald was the shooter on 11/22 but because VB "rubs their snouts in their own feces" they will never admit it. They react by trying to trash the WC and Bug's contribution in RH. Those especially scorned are the conspiracy authors who have undertaken decades of 'work' in their respective area of 'expertise' and their life's work will be seen as meaningless if they fold up their tent and depart the scene. Anybody know about whether anyone has challenged Bugloisi to a debate other than Wecht? 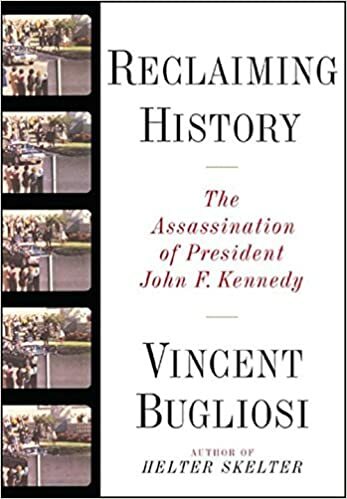 "Former Los Angeles prosecutor Vincent Bugliosi claims to be "Reclaiming History" from the riffraff of conspiracy theorists in his massive new book on the assassination of President John F. Kennedy. The term "conspiracy theorist" is practically married to the assassination, tossed about the way the House Un-American Activities Committee used to throw around "Communist sympathizer." One size fits all! But according to Bugliosi, conspiracy theorists are the reason more than 75 percent of Americans don't believe the conclusions of the Warren Commission, established by President Lyndon Johnson to investigate the crimes. Bugliosi's intent is to expose its critics as "fraudulent" on the way to resurrecting the conclusion of that panel, which found that Lee Harvey Oswald acted alone. The first question to Bugliosi must be, "Who cares?" For more than 40 years, every wingnut outside the city limits of Roswell, N.M., has gravitated to the Kennedy case, and Bugliosi attempts to list them all. For instance, in a footnote, he skewers someone named Nord Davis Jr, who apparently believes 21 bullets were fired in Dallas' Dealey Plaza and that Parkland Hospital doctors confused police officer J.D. Tippit's body with that of Kennedy. Or take the case of James Fetzer, Ph.D., who, Bugliosi points out, has been on a crusade for the past decade to prove that the Zapruder film "is a complete fabrication" put together by some shadowy intelligence agency. Many historical events draw wacky theories. The proper response is to ignore them; it is not to write a 1,660-page book exposing their wackiness. ON THE OTHER HAND, the Kennedy case is remarkable in that the growth of conspiracy theories has come to obscure the basic evidence. It is as if opinions and wacky theories have grown like a fungus into the basic pattern of facts. From the outset, this growth threatened serious research into what actually happened in Dealey Plaza. Bugliosi has performed a useful function by scrubbing away a number of nutty theories that have surfaced since Nov. 22, 1963. But what about Bugliosi's more serious intent -- to resuscitate a variant of the Warren Commission's account of the assassination? In 1993, another lawyer, Gerald Posner, tried the same thing in his book Case Closed. Yet Bugliosi cites numerous examples of Posner's "distortion" and "misrepresentation." He quotes approvingly a Washington Post review of Posner's book, which criticized him for presenting "only the evidence that supports the case he's trying to build, framing the evidence in a way that misleads readers." But this is exactly what Bugliosi does. Like any experienced prosecutor, he highlights the evidence that furthers his case while ignoring or confusing contrary evidence. Examples of this approach can be found almost everywhere in the book. Take his spirited defense of Warren Commission junior counsel Arlen Specter's "single-bullet theory." Bugliosi agrees that this theory -- that Kennedy and Texas Gov. John Connally were hit by the same bullet -- is necessary to conclude that Oswald acted alone. He also acknowledges that the theory was developed by Specter and other commission staff members in the spring of 1964 to save the single-assassin conclusion. He also notes that when the time came to approve it, the commission split down the middle. To his credit, he tells us Connally denied from first to last that he was hit by the same bullet that hit Kennedy. His wife, Nellie, testified that she heard a shot and saw the president react to being hit. Only then did she see and hear a second shot crash into her husband's back. Bugliosi tells us Nellie Connally was "confused" and that her husband relied upon her confusion. However, you will find nowhere in Bugliosi's book the fact that no witness in Dealey Plaza could attest to both men being hit by the same shot or that the FBI's review of the Zapruder film led them to conclude Connally and Kennedy were hit separately. He tells us that Dr. Malcolm Perry at Parkland Hospital estimated the size of the supposed bullet exit hole in JFK's throat to be "3 mm to 5 mm in diameter," but he neglects to tell us that wound ballistics experts at Edgewood Arsenal carried out experiments showing bullets from Oswald's rifle would cause exit wounds two to three times that size. Even more egregious is his handling of the trajectory through JFK's back and neck. A face-sheet on which notes were taken during the autopsy shows the supposed exit wound in the throat to be higher than the entry wound in the back. When the autopsy photos were finally produced in the 1970s, a medical panel concluded that the course of the bullet through Kennedy was at an upward angle (the accepted number is 11 degrees). So how does Kennedy get shot from the sixth floor of a building when the bullet takes an upward path through his body? The Warren Commission took the simplest course. The staff let the autopsy doctor instruct a medical illustrator to raise the back wound from the back to the neck. Commission member U.S. Rep. Gerald Ford then corrected a final draft of the panel's report to read "neck wound" rather than "back wound." Voila, a "back wound" had become a "neck wound." Faced with that 11 degree upward angle, the House Select Committee on Assassinations took a more inventive approach in its 1978-79 investigation. It just leaned Kennedy forward at the time he was shot. And Connally, who took a shot at a 27-degree downward angle? His body position was leaned back a sufficient amount. Voila, an 11-degree upward angle through one body had become a 27-degree downward angle through a second body, thus a straight line had been maintained. Like any good prosecutor, Bugliosi admits it was "upward" but never tells us how much. Then he publishes a diagram from the House's report showing Kennedy bent forward. He says in a caption that the diagram shows "his head tilted forward slightly more than it actually was as shown in the Zapruder film." That's quite an understatement since the Zapruder film never shows Kennedy bending forward at all. He's sitting erect in the back seat waving to the crowd. Then when the limousine travels behind a sign and emerges three-quarters of a second later, he's sitting erect but wounded. Does Bugliosi offer anything new? Not much. Three explanations -- Bugliosi, the Warren Commission and the House committee -- claim Kennedy was shot in the head at Zapruder frame 313. Bugliosi and the commission say Kennedy and Connally were hit simultaneously while the car is behind the sign, frames 207-224. The committee moves this single-bullet, double hit earlier to frame 190. It also cites four shots in all with two additional misses fired from the grassy knoll at frame 290 and the sniper's nest in the book depository at frame 160. The commission found that a third shot missed but cannot determine when it was fired or where it hit. Bugliosi has a first shot fired at frame 160, which misses the limousine entirely. None of these reconstructions makes much sense. All three require that a large body of evidence indicating JFK was hit in the head from the right front be simply disregarded. All three face the fatal objections to which the single-bullet theory has been subject from the very beginning. The House Select Committee's reconstruction requires the putative gunman in the book depository to have fired blindly into a tree when he would have had a clean shot only a second and a half later. Bugliosi's minor change to the commission's reconstruction makes less sense than the original. One would expect the first shot from a sniper to be the most accurate. Why would a shooter miss the limousine entirely on his first shot when it was right below him and Kennedy was large in his sight, then hit Kennedy twice with his next two shots at greater ranges? As the commission noted, most Dealey Plaza witnesses placed the first shot significantly later. Phil Willis, for example, said the first shot jarred his finger on the shutter of his camera and produced a photo taken at frame 202. The real scandal of the aftermath of the Kennedy assassination is that no reconstruction of the event makes sense. We know the event happened in one way rather than another. But the evidence is discordant and irreconcilable at a primitive level. The meaning of this discordance is unclear, but the simplest explanation is that not all the "evidence" is really evidence. What is crystal clear, however, is that more than 43 years after the event we don't know what happened. From the very beginning, the event has been left to advocates of one view or another. The Warren Commission put together a case for the prosecution against Oswald. It failed when critics showed its conclusions were not justified by the evidence it considered. The same could be said for the House Select Committee, which reached a conclusion diametrically opposed to that of the Warren Commission. What this case doesn't need is more advocacy on the part of lawyers like Posner and Bugliosi. They squeeze the evidence into one mold or another, offering opinions on this or that, buttressed by whatever they choose to tell us, ignoring the rest. What this case does need is some old-fashioned, historical scholarship. It's a shame and a waste of great time and effort that Bugliosi decided to contribute to the problem and not to its solution." Vincent Bugliosi's conclusion of no conspiracy should make you want to look at the JFK Assassination and dig in to the case . Reclaiming History and the Warren Report should be both in the Fiction section of the library. Now Dr. Cyril Wecht already told us that the Warren Report should be in the Fiction area of the Library and I think it is safe to say that Reclaiming History belongs in the fiction area also. I don't think there is one page in Vincent's book that does not refer to some disclaimer of conspiracy. I have the book & I have to make myself go back and pick up where I left off and read some more and then just set it down because it's a broken record . Have any of you tried to read this book? It's a mile long just like the Warren "26 volume" Report that Dr. Wecht says does not have an index. After 55 years still no credible replacement for Dirty Harvey as prime suspect. What, too soon? Jim Garrison dies and arrives at the Pearly Gates. His first question is obvious. God replies that Oswald killed Kennedy, and did it alone. Garrison exclaims "Wow! I had no idea that the conspiracy went this high!